The firm of solicitors at “Sadler House”, no. 46 High Street, is over two hundred years old. It has moved along the road from the original premises at no. 36, where three generations of Sadlers had their offices in the nineteenth century. The old Warwickshire family of Sadler of Over Whitacre and Castle Bromwich came into contact with Sutton Coldfield early in the eighteenth century, when William Sadler was one of the governors of the Grammar School (now Bishop Veseys Grammar School). William Sadler of Castle Bromwich, gentleman, became a Governor in 1732, and when new trustees were appointed in 1757 they included William’s cousin Miller Sadler of Over Whitacre and William’s nephew William Sadler of Castle Bromwich; twenty-five years later the son of William Sadler of Castle Bromwich, Edward, became a trustee. Edward did not style himself as “gentleman”, but as an attorney and solicitor. Edward Sadler was closely involved in Sutton affairs - he was the legal representative of the opponents of enclosure in 1778, and acted for the townsfolk who challenged the Warden and Society in the Court of Chancery in 1788, a case which lasted thirty-six years. He defended Abraham Thornton in his trial for the Penns Lane murder of Mary Ashford in 1817. 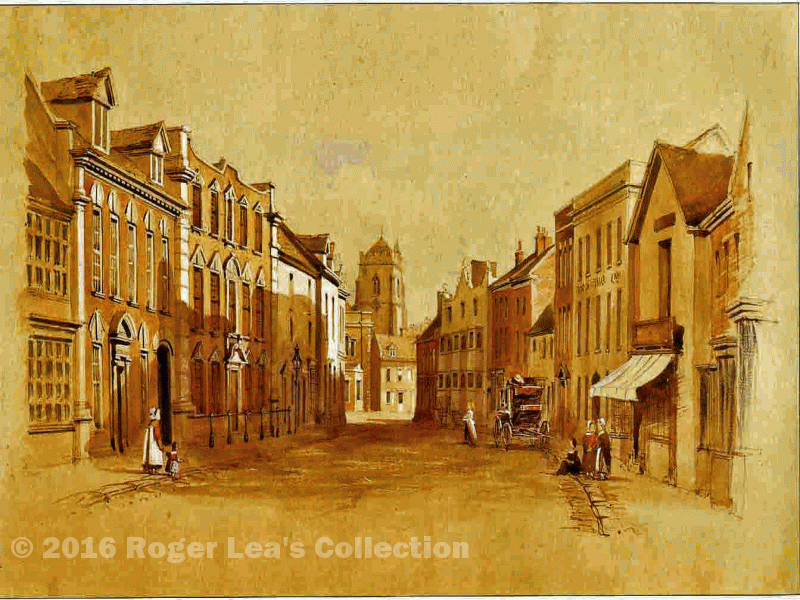 Edward Sadler moved his practice to Sutton, coming to live at 36 High Street at the beginning of the 1800s. When Edward Sadler died in 1837 aged 79 he was succeeded by his son Richard. Richard had two sons, and the young Richard Holbeche was a frequent visitor - he recalled going to play with the Sadler boys there in his “Diary” - there was a splendid oak-panelled drawing room and the solicitor’s office used to be at the back of the house up some steps. To get to this office clients would go through the archway at the side of the house, and still to be seen above this archway at 36a High Street is the heraldic crest of the Sadler family, a rampant lion with a red crown. Richard Sadler died in 1856, a rich man - his widow Sarah described herself as a landed proprietor at the 1861 census. By 1871 Sarah had died and her sons Richard and Ralph were living at no. 36 with their aunt as housekeeper; Richard Hurst Sadler, 24, was a solicitor, and Ralph Stanley Sadler, 22, a law student. R.H.Sadler continued to prosper like his father - he bought the Anchorage Estate in 1869, and was elected to the Warden and Society in that year, aged 21. In 1881 he was living with his family at Moat House - no. 36 was by then a school run by Mrs Cull and her daughters, ever after known as “Culls House”. Then in 1893 the Sadlers moved to their new house, “The Leasowes”, 107 Lichfield Road, built for them by the noted architect Ernest Newton. Richard Hurst Sadler had been elected as a councillor to the new Borough Council in 1886, and progressed to be Mayor of Sutton Coldfield from 1903 - 1906. 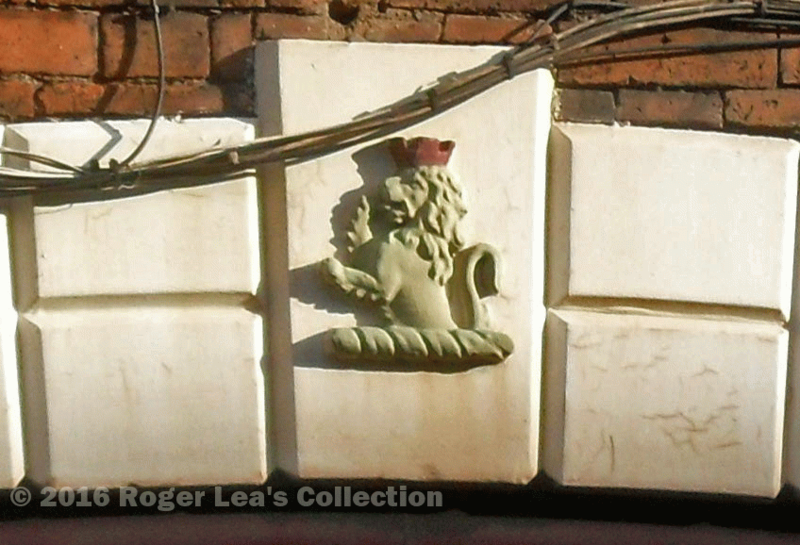 The Sadler crest on the keystone of the arch at 36a High Street.